Fort Mountain lies in the Cohutta Mountains, and on Fort Mountain is Fort Mountain State Park. It's an eerie place. I went there with a friend of mine - hi, Richard! - on a cold, almost snowy day in early winter. Fog. Lots of fog. Half the time the visibility was down to 20 yards, sometimes 20 feet, which only added to the general frisson of excitement of an unknown mountain trail. We didn't know what was going to be around the next bend. In more ways than one. You see, there's a ruined stone fort on Fort Mountain, and not only does it predate the arrival of Europeans, but the Cherokee claim that it predates them. The ruins are an 885-foot long rock wall which zigzags around the peak. The ruins also contain 19-29 pits (depends on who's counting, I guess), as well as what looks like a gateway. It may date to 500 AD. It might be older. It might be newer, but not by much. It's a very strange place, and there are a few strange stories about it. Story #1: European Version 1: The Welsh Prince. Madoc, son of Owain Gwynedd, King of Gwynedd in north Wales, had to flee a fight over succession after Owain died in 1170. He fled to America, (300 years before Columbus), and wandered the continent, building and breeding lavishly wherever he went, leaving lost tribes of Welsh Indians, white Indians, etc., everywhere he went. So naturally at some point he arrived in Georgia and built a fort to protect himself from the marauding tribes around him. 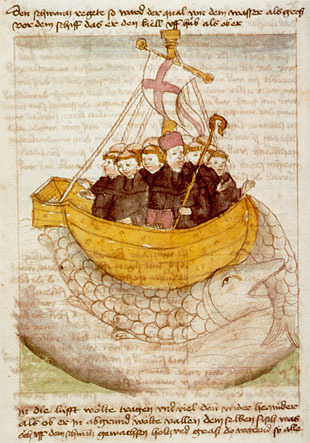 St. Brendan the Navigator, 15th C. ms. The Madoc legend is based on a medieval tradition - and I mean a tradition, not a story or even a poem - about a Welsh hero's sea voyage. To be honest, we have more evidence of Brendan the Navigator than Madoc. Nonetheless, this was a hugely popular legend during the Elizabethan era, because it gave Elizabethan England a foundation for claiming title to North America. All of it: after all, Madoc was said to have landed at "Mobile, Alabama; Florida; Newfoundland; Newport, Rhode Island; Yarmouth, Nova Scotia; Virginia; points in the Gulf of Mexico and the Caribbean including the mouth of the Mississippi River; the Yucatan; the isthmus of Tehuantepec, Panama; the Caribbean coast of South America; various islands in the West Indies and the Bahamas along with Bermuda; and the mouth of the Amazon River" (Fritze, Ronald H. (1993). Legend and lore of the Americas before 1492: an encyclopedia of visitors, explorers, and immigrants). Sounds like he conquered the continent, doesn't it? So of course Madoc was given credit for building everything and anything that Europeans couldn't believe the indigenous peoples built, from natural formations like Devil's Backbone in Kentucky to man-made buildings like Fort Mountain in Georgia and the Pueblos of New Mexico. And he was given credit for fathering every tribe later European settlers liked, from the Mandan to the Zunis, Hopis, and Navajos. Story #2: European Version #2: The Moon-Eyed People are one of the lost tribes of Israel, per the Book of Mormon. BTW: The Cherokee County Historical Museum in Murphy, North Carolina has what is supposedly an effigy of The Moon-Eyed People. (I tried to post it, but it just doesn't want to, so check out the link HERE, at Roadside America. Anyway, the Cherokee and the moon-eyed people fought a great war, and at the end of it, the moon-eyed people were killed and/or dispersed. (Benjamin Smith Barton, 1797) The Cherokee may or may not have used the fort. In any case, the story says that the fort was destroyed in a massive earthquake which shook the whole world - or at least the entire area - and caused the stone walls to collapse. One version of the earthquake says it took place after the Cherokee-moon-eyed people war, because the Cherokee who were living in the fort were killed, while the Cherokee who were living in wooden houses weren't. Another version is that it was the earthquake that allowed the Cherokee to win the war, and that afterwards, the moon-eyed people went underground and in caves. So, we have a pale tribe that couldn't see well at night. Albinos or Madoc? Personally, I plump for albinos. The Kuna people of Panama and Columbia "have a very high incidence rate of albinism. And, whereas in many cultures albinos are subject to everything from ridicule to persecution to murder, in Kuna mythology, albinos (or sipus) were given a special place. Albinos in Kuna culture are considered a special race of people, and have the specific duty of defending the Moon against a dragon which tries to eat it on occasion during a lunar eclipse. Only they are allowed to go outside on the night of a lunar eclipse and to use specially made bows and arrows to shoot down the dragon." (Wikipedia) And, the Zuni and Hopi nations also have high rates of albinism. It's not Welshmen, it's genetics. Story #4: European Version #3: Reptilians, or David Ickes Strikes Again: Of course, in this day and age, the moon-eyed people have become part of the whole "Ancient Aliens" mythos. Some people have speculated that the moon-eyed people were actually vampires. The legendary David Ickes has decided they're a sub-species of the reptilians who are dwelling among us (mostly in public office). 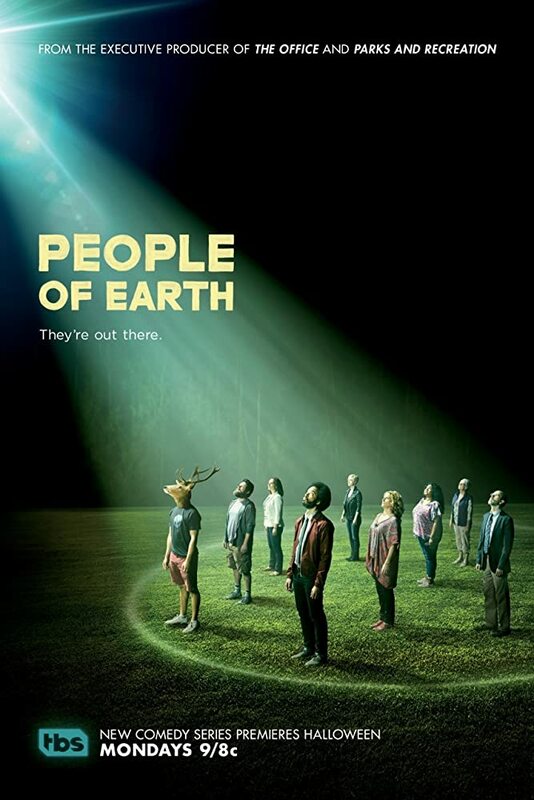 Thus the moon-eyed people are still among us (because you can't kill them), and speaking of reptilians, did you know that the TV series "People to Earth" (about a support group for people who claim to have been abducted by aliens) is coming back to TBS on Monday, July 24th? I, for one, can hardly wait.